As a former professional football player and avid sports enthusiast, Dr. Gregg Carr has a special interest in sports medicine. He provides state-of-the-art care for patients suffering from a variety of common sports-related injuries, such as those resulting from overuse and trauma. Dr. Carr combines his training in Sports Medicine, Engineering, and General Orthopaedic Surgery to bring a total approach to your treatment. Dr. Carr’s passion for orthopaedic medicine has deep roots. As a member of Auburn University football’s “Team of the Century,” Dr. Carr was recognized as both an Academic All-American and Athletic All-American. After graduating from Auburn University with a degree in Engineering, Dr. Carr went on to play inside linebacker for the Pittsburgh Steelers for four seasons. Dr. Carr's drive to become an orthopaedic specialist began when his professional football merged with his engineering training, creating an enduring interest in the mechanics of human joints. 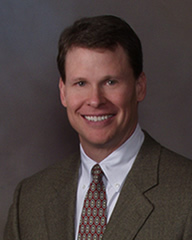 While playing professional football, Dr. Carr completed the requirements for medical school and in 1994, he received his medical degree from the University of Alabama, School of Medicine. Dr. Carr completed his orthopaedic surgery residency at Greenville Hospital in Greenville, South Carolina, where he also served as chief resident. He was then awarded a fellowship in Sports Medicine at the American Sports Medicine Institute in Birmingham, Alabama where he trained under some of the top sports medicine physicians in the country. A native of Birmingham, Alabama, Dr. Carr is a physician who truly understands orthopaedic challenges from all points of view. Surgeon, patient, engineer, parent, football player – Dr. Carr knows orthopaedic medicine from all of these angles and his patients benefit from this exceptionally broad spectrum of insights. His patients, including children and adults, athletes and non-athletes, all receive the same expert care and personal attention. Dr. Carr and his wife, Juli, have five children: Evans, Jordan, Sara, Grace, and Ann Harrison. Dr. Carr sees patients at clinics in Homewood and Columbiana. Please call for office schedules and help with directions.